When users sign up for your mailing list, you will often want to know which form they signed up from. Did they sign up from the form in the header? Did they sign up from the form on the sidebar? Was it from the form in the About page? From the form in the footer? With MailChimp and Magic Action Box plugin, this is very easy to do. First, you will need to create a hidden field in MailChimp. MailChimp already has an awesome guide on how to do this. Since you will also be using Magic Action Box, you will only need to follow the first part of the guide – “add a hidden field and grab form code” section. Next, we will set up the tracking code for your MailChimp action box. Select MailChimp as your Mailing List Provider. Select the List users will be signed up to. Below that should be the Track Signup Location fields. 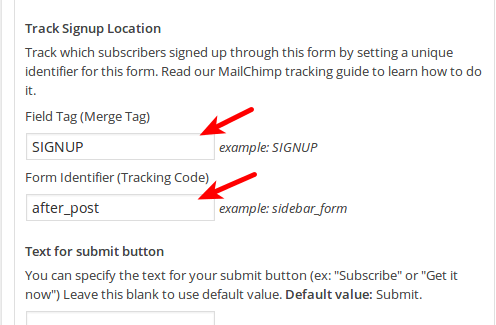 Assuming you followed the MailChimp guide above to the letter and used SIGNUP as your field tag (or merge tag), enter the text “SIGNUP” (without the quotes) into the Field Tag field. Next, we identify this particular form. Assuming you are using this opt in form action box to be displayed after blog posts, enter the text “after_post” (again without the quotes) into the Form Identifier field. That’s it. Now, when you check your list in MailChimp, you should now see a new column named SIGNUP and users who signed up through the form we created should have the text “after_post” for that column. Now, when you check your list in MailChimp, you should now be able to see the users who signed up through your sidebar and who signed up after the blog post and group them as you like.